Few bands have been able to cash in on their bad habits, dirty minds and questionable life choices quite like power-pop band THE PINK SPIDERS. The band, made up of members Matt Friction (Vocals, Guitar), JoCo (Bass) and Joey B-Side (Drums) have gained almost as much notoriety for their exploits, attitude and iconic look, as they have for the catchy and explosive sound they generate. The band had been enjoying a brief hiatus until a wildly successful pop-up show in late 2016 celebrating the ten year anniversary of 2006’s Teenage Graffiti LP laid the framework for an auspicious future and another full length record. That album, titled Mutations, was released on July 31, 2018 12” on hot pink vinyl via Mean Buzz Records. This newest record, tracked and mixed in the band’s hometown of Nashville, TN, is eleven songs of power-pop perfection recalling the sweet hooks and blistering pace of the SPIDERS’ second LP Teenage Graffiti. The band has released videos for lead singles “Black Dagger” and “Capital F” (the latter exclusively premiering via Alternative Press) and they’ve hit the road for most of the year to celebrate the new release with fans. 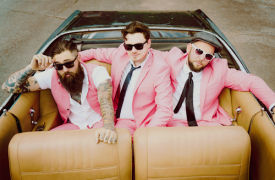 Infamy and chaos have followed THE PINK SPIDERS since they first stormed onto the Nashville music scene in 2004 with their self-released debut EP The Pink Spiders Are Taking Over. It was that notoriety that translated into immediate results, as the band signed to their first indie deal less than 6 months after forming. The guys quickly generated a big buzz with their 2005 indie label release Hot Pink, an infectious dose of dark pop detailing fast getaways and cheap thrills. Less than three weeks after the Hot Pink release, and in the midst of a nationwide tour, the band found themselves at the center of a major-label bidding war. THE PINK SPIDERS landed a deal with Geffen Records, and in short order released their highly praised major label debut, Teenage Graffiti. Produced by hit-maker and legendary frontman of THE CARS, Ric Ocasek, Teenage Graffiti stood out from the pack with the hit "Little Razorblade," which exploded on radio stations from coast to coast as well as on Total Request Live, with MTV describing Teenage Graffiti as "a collection of sweaty, fist-pumping anthems" and declaring that THE PINK SPIDERS' "rock and roll assault was underway." That album, coupled with the band's no-holds-barred live show, earned them a summer-long appearance on the Van's Warped Tour, a post-game headlining concert in the outfield of Dodger Stadium, and heaps of praise from such respected media outlets as Spin, Billboard, Blender, USA Today and more. Tv Party is made up of five friends from Ventura, CA. Jesse Brinkenhoff's vocal tone has been compared to the likes of Peter Murphy (Bauhaus) and Julian Casablancas (The Strokes). The music is reminiscent of late 70's / early 80's power pop. Bridging the early punk sound of New York and London, Tv Party delivers a fresh darkness with a full band sound.